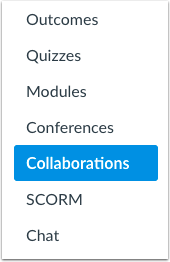 The Collaborations Index Page allows you to create collaborations for users in your course. You can create new collaborations, edit existing collaborations, and delete collaborations. If your institution grants permission, students can create collaborations in the course. You can always view any collaboration created by a student in the course, though other students can only view collaborations that have been shared with them. If you have created groups in your course, students can always create collaborations within groups. The Collaborations page displays all collaborations that have been created for the course. For each collaboration, you can view the name of the collaboration , the description , the person who created the collaboration , and the date and time the collaboration was created . To create a new collaboration, click the Start a new collaboration button. Depending on your institution's preference, you may be able to create a Google Drive collaboration or create a Microsoft Office 365 collaboration. If your collaborations page does not match the image shown in this lesson, you can still create a Google Docs collaboration. To open a collaboration, click the name of the collaboration. Note: The collaboration will open in a new tab. You may be asked to sign in to view the file. To edit a collaboration, click the Edit icon . To delete a collaboration, click the Delete icon . Previous Topic:How do I use inline Chat as an instructor? Next Topic:How do I create a Google Drive collaboration as an instructor? Table of Contents > Collaborations > How do I use the Collaborations Index Page? Re: Why is it so difficult/cumbersome to give an assignment to all groups within a group set?